For, to truly enjoy the third installment of this fantasy, it's not just enough if you go and plunk yourself in your favorite row at the theater. You need to be equipped with cheatsheets filled with flow charts to explain the plot, and state-charts so that you can understand when one character is betraying another. And footnotes to help you understand why what happened actually happened, once you get out of the theater. Either that, or acquire some disability from some Kurt Vonnegut science fiction setup, that allows you to concentrate just on 5-minute intervals, with no memory of what happened before, or interest in what happens afterwards. Pirates of the Caribbean: At World's End starts with the East India company tyrannizing pirates across the length and breadth of the oceans, with an unwilling accomplice in Davy Jones (Bill Nighy), whose heart is under their captivity. Elizabeth Swan (Keira Knightly) is racked by the unexposed guilt of having delivered Jack Sparrow (Johnny Depp) to the Krakow, and is looking to redeem herself by rescuing him from Davy Jones' locker. Will Turner (Orlando Bloom) is interested in acquiring the Black Pearl so that he can free his father from eternal servitude aboard the Flying Dutchman, and Capt Barbossa who arrives from nowhere needs to rescue his erstwhile Captain Jack, as a meeting of the nine pirates has been convened to find a solution to the EIC problem. It's Barbossa's idea that Calypso, the Goddess of the Sea, be released from her human form, in which she has been imprisoned by the first Pirate Council, so that Davy Jones can be neutralized. Several trips across various continents, double-crosses, new characters, fulfilled romance and hair raising fights later, we come to the grand finale of the series, which by no means is final. Along the way, we have Jack being rescued from the Netherworld, a new gadget in a magical set of charts to any part of the known and unknown universe exposed, a wedding that takes place in the pitch of the battle at the heart of a maelstrom, and, for the first time, a Pirate King. Keira Knightley is the unlikely Pirate King, and all is well with her role, till she decides to deliver an emotional and stirring speech, goading her fellow pirates to take upon a British armada consisting of hundreds of ships. Characters walk in and out of the screenplay, halfway before they're appropriately built up. There's an interesting Indian connection in Sri Sumbhaji, Pirate Lord of the Indian Ocean, who looks a Sardar and has a crew that dances Bhalle Bhalle style for exactly two seconds in the movie. 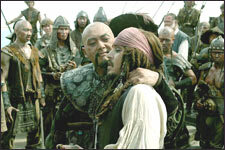 Chow Yun-Fat plays Sao Feng, the Pirate Lord of the South China Sea, creditably. The visuals are the best feature of the movie, and deserve a 11 on 10. The voyage through Antarctica almost transports the audience into the distant cold seas The brilliant white expanse of Davy Jones's Locker is a visual delight, and the night scene that shows the Black Pearl slicing through the dark water, brilliantly speckled with the shining stars, is a surreal masterpiece, totally spell-binding. While the entire cast gives excellent performance, Johnny Depp, although making a late entry into the movie, stands out by stealing every frame that he is part of. He is the act, and his zany humor, overwhelming self-interest, kindness when it doesn't compromise him, and one-upmanship in negotiations, give him the best place in your heart; except when you have to content yourself with hordes of his imaginary clones (the director doesn't really leave any trick in the book to confuse you). Be the first to comment on Pirates Of The Caribbean - At World's End (Telugu)! Just use the simple form below. fullhyd.com has 700,000+ monthly visits. Tell Hyderabad what you feel about Pirates Of The Caribbean - At World's End (Telugu)!